SS1 Free Float® steam trap features a unique, three-point seating to ensure a perfect steam-tight seal, even under low condensate load conditions experienced in superheated steam lines. Steam distribution mains are often characterized by small condensate loads and long hours of operation in addition to being outdoors. To be effective, steam traps fitted on these installations must lose only very small amounts of steam during condensate discharge cycles, while offering reliable and stable long-term operation. The SS1 Free Float® steam trap responds to this need by featuring a three-point seating that ensures a steam-tight seal, even under the low condensate load conditions experienced in superheated steam lines. To enable a long service life, the SS1 Free Float® steam trap has only one moving part: a high-precision spherical float that rotates within the trap to allow its entire surface to function as the valve-sealing surface. The steam trap's valve opening is also under a continuous water seal, preventing steam from escaping through the valve. The SS1 Free Float® steam trap is now used in numerous manufacturing plants to help maximize process efficiency. 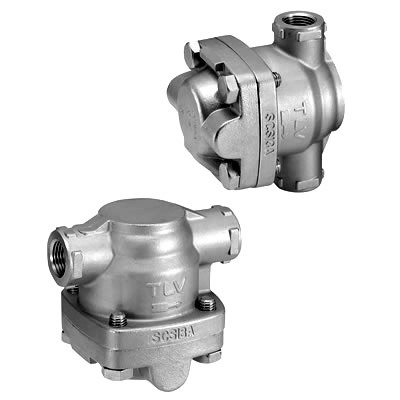 Unlike conventional mechanical steam traps - with their complex bucket, lever and hinge mechanisms - the spherical float in TLV's Free Float® steam traps is the only moving part. This helps guarantee a long life and reliability, and results in an excellent sealing performance, even under conditions of low condensate flow at high pressure and temperature. The steam trap has a maximum operating pressure of 21 barg and its stainless-steel construction makes it ideal for specifications requiring extremely high levels of durability and corrosion resistance. It also offers inline access to internal parts to simplify cleaning and reduce maintenance costs and is available for use with screwed, socket-welded or flanged connections.